The new Santa Fe Impact Dehumidifier (Santa Fe Impact XT) is exceptionally energy efficient and one of the best models for your crawl space or basement. The Santa Fe Impact is a crawl space unit recently added to the Santa Fe range. The Impact has a water extraction rate of 105 pints per day and is suitable for areas not exceeding 2500 square feet. It is currently (Feb 2012) retailing for around $1865 which is a competitive price for a model of this quality in its class. The most remarkable feature of the Santa Fe Impact Dehumidifier is its low energy consumption. With an amp draw of just 4.9 this unit consumes a very low 530 watts per hour. The Santa Fe Impact XT is designed for installation in areas where space, particularly head room, is limited. It is therefore ideal for use in a large crawl space. With a 105 pints per day water extraction rate it fills a "gap" in the Santa Fe range between the 90 pint Santa Fe Advance and the 150 pint Santa Fe Max Dry. 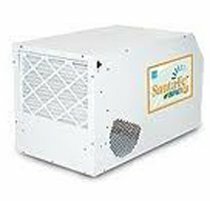 Like all Santa Fe crawl space models the Santa Fe Impact Dehumidifier is equally suitable for use in a basement. Although its capacity is little different from that of the Santa Fe Classic the lower, longer casing design may make it more suitable for installation in a convenient spot where the Classic, with its "upright" design may not fit. The Santa Fe Impact Dehumidifier is very new. It is so new that, as I write this review (Feb 12 2012), there are still three days to go before this unit arrives in the warehouses of retailers. Obviously there is no consumer experience to draw on so what can I say about the Santa Fe Impact? First, this is a Santa Fe model from Therma-Stor. Therma-Stor dehumidifiers are made in the USA. The company has a wealth of experience and all of its products so far have proven effective and reliable. Second, the Santa Fe Impact achieves a ground breaking level of energy efficiency. The minimum standard required by Energy Star for qualification of models rated at 75 to 185 pints per day is an Energy Factor of 2.5. The Impact achieves an EF of 4.2! For anyone with a moderately cool basement or crawl space of up to 2500 square feet the Impact must be well nigh irresistible. Following my unusual outbreak of enthusiasm :) I must add two cautionary notes. The Impact is untried and untested. It could prove to be the one that Therma-Stor got wrong. I think this is unlikely but I will refrain from an all out recommendation until the jury is in. My second caution is to repeat my remark from the "Applications" section. This is not the right appliance for those of you who need it to operate in a basement or crawl space at really cold temperatures. However energy efficient a dehumidifier may be it must also be effective in the conditions found in your basement to be a good buy. If Santa Fe have produced another dehumidifier as good as their previous models, and subject to the note about low temperature operation, the Santa Fe Impact Dehumidifier will be a winner and I shall be happy that mine was the first independent review site to have brought it to your attention.